I learnt this from my MIL. 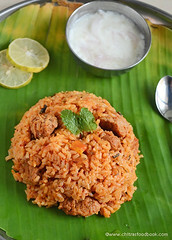 Its a very tasty one pot meal recipe.I usually make it for dinner.I use noi arisi ( broken rice ) to prepare this upma. Its available in all grocery stores. If u don’t get this rice, u can just break the raw rice by running in the mixie once or twice. No side dish is needed. If neede it can be served with chopped onions. It can be made in jiffy.Apt for bachelors and working women! Then add the tamarind extract to the cooker base and the turmeric powder & required salt. Add a dash of hing again. Add fresh curry leaves too. 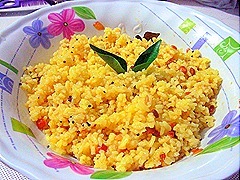 ( these two items adding at the end gives a spl flavor for this upma ) Now add the washed & drained rice into the cooker. Mix it well & close the lid.Keep it for 10-15 mins or 3 – 4 whistles. Once the steam is released , serve it hot. U can make the same in rice cooker too. For rice cooker,u need to add 3-3.5 cups of water.Enjoy eating hot topped with sesame oil. If u don’t have broken rice in hand,just grind the raw rice in mixie very coarsely. Run the mixie once or twice to break the rice.Then use as mentioned above. Adjust the quantity of red chillies based on ur spice level. Do not add more water than the mentioned quantity.Upma will become mushy. I got this recipe from a website. I usually make dosa & upma with rava. I found this one very easy & can be made in jiffy.Tasted so good. Do try this.I am sure u’ll like it. Mix all the ingredients given above in a bowl. Add water to make the batter slightly thicker than idly batter. Drizzle little oil around it.Cover & cook for sometime. Flip it & cook for some more time. Enjoy with the chutney of ur choice..
For variations u can also use sour buttermilk instead of curd & water .. 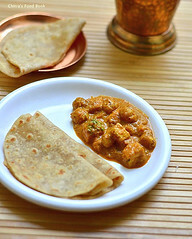 I tried this from Mallika badrinath’s cookbook.It tasted excellent and easy to prepare. Its a nice combo for roti & naan..
SPINACH/ PALAK bunches – 2 nos (medium size ) or 2 cups of leaves. Big onion – 2 nos. Wash & chop the spinach leaves .Heat oil in a kadai and saute the leaves till it shrinks and cook well..set aside. 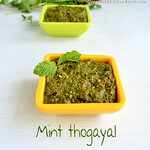 Grind all the ingredients given under "to grimd" to a smooth paste and finally add the cooked palak .. Grind smoothly and set aside. Heat a kadai with ghee / oil and add the ground paste. Saute till the raw smell disappears. Take the paneer cubes and put it in boiling water for 15 mins.Put the paneer cubes in the masala and add little water. Cover cook for sometime stirring in between. Switch off the flame and add few drops of lime juice and a tbsp of cream . Mix well & serve.. Enjoy hot with roti, naan ..
My MIL is an expert in making Rava ladoo without using milk and coconut (Semolina ladoo in English). Generally South Indians make rava laddu for special occasions at home. People make this sooji ladoo just by using roasted rava. But my MIL makes it different from the usual method. Just because of this variation my husband loves this ladoo a lot. I’ve tried this rava laddu for many occasions. Its a fool proof recipe. It never went wrong. Try this and let me know friends :) I am bad in shaping the ladoos .So please bear with the irregular shapes;) Ok, lets see how to prepare rava laddu with step by step pictures. Dry roast the rava till nice aroma arises. Make sure the color of rava doesn’t change. In a mixie powder the rava , sieve it. Powder the sugar & sieve it . Mix them well. Now add the roasted cashews and elachi powder . Mix well. Add the Melted ghee little by little and mix well. Stop the ghee when u are able to make a ball..Make even sized balls out of it and store in an air tight container. Enjoy !! U can add milk and reduce ghee to make laddus . But the shelf life will be reduced..
Kara pori / Spicy puffed rice/ spicy murmura with garlic is our family favourite snack recipe which I learnt from my MIL. I usually make this with leftover/soggy puffed rice we buy for Saraswathi pooja. Its a very simple,easy to make,low calorie and tasty snacks recipe which can be eaten all through the day without guilty. Lets see how to make this spicy puffed rice recipe with garlic. Soon I will share a no garlic masala kara pori recipe. 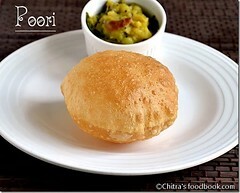 Do check out my Beach style kara pori recipe here . Take a wide mouthed kadai and add a tbsp of ghee.Spread it all over the pan.When it becomes hot,add the peanut and dal ( If adding ), Curry leaves, sambar powder, salt, turmeric powder and slightly crushed garlic flakes ( no need to peel the skin)..Fry everything for a moment in low to medium flame.Do not burn them.Nice aroma arises. Now add the puffed rice, toss it till its coated uniformly and switch off the flame. Mix it well with the fire off and allow the puffed rice to remain in the kadai for sometime to become crispy. ( Note: If u try to eat it hot, puffed rice will be soggy & soft.It will become crispy only after it cools down). For variations, you can use 3/4 tsp red chilli powder + 1/8 tsp turmeric powder. You can also use leftover soggy puffed rice. No need to use crispy puffed rice/ murmura. U can store this pori in an air tight box after its cool down completely and enjoy for few days with coffee/Tea. You can skip garlic and make it as a no garlic version. But i feel garlic adds more flavor to this recipe.My husband likes to eat garlic with skin.But I remove the skin while eating.Finally its ur choice! Use ghee for tempering. Do not avoid it. I wanted to try thogayal with mullangi for a long time.We all usually make sambar , poriyal & roti . I tried this way to make thogayal . It tasted yummy when mixed with plain rice & ghee.I dint find the raw smell at all.Try this ladies !! I am sure u’ll love it.. Cooking oil – As needed. Peel the skin & grate the radish.Saute radish with ginger in 1 tbsp of oil till it gets cooked . Saute in low flame .Then remove & set aside. 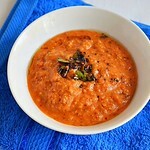 Roast the red chilly & urad dal with hing using 1 tbsp of oil. Grind everything with tamarind, salt & water. Mix with hot plain rice topped with ghee and enjoy !! Pressure Cook toor dal and set aside. Cut the raw banana into small cubes and allow it to cook with sambar powder, salt & required water. When it is done , add the tamarind extract , toor dal and boil for sometime. Temper the mustard seeds , urad & channa dal , hing and grated coconut. Roast the coconut well and add all the tempered items to the gravy /kootu. Finally add a tsp of coconut oil for additional flavor. 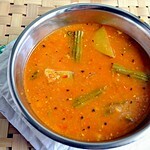 Mix with plain rice topped with ghee or serve as an accompaniment for sambar rice .Enjoy !! 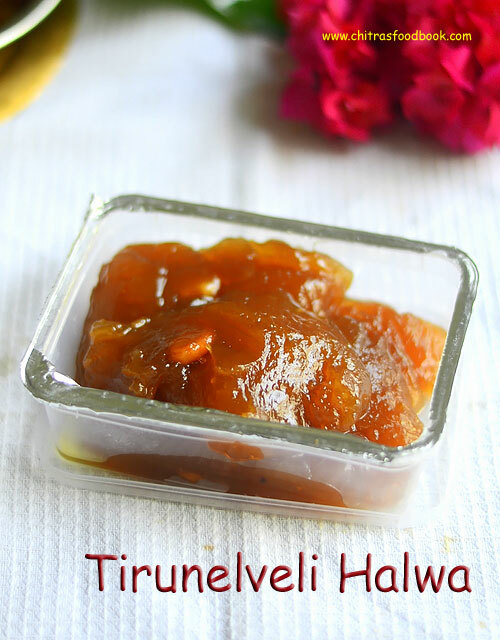 Being a native of tirunelveli , i had an eye on this halwa for a long time . For this diwali i thought, i should make something that i never tried so far. At last my search ended up with this halwa. I referred this video ( 3 PARTS ARE THERE) & this blog for the recipe. I too made some changes.It was a huge success at home. Halwa looked glossy and tasted as we get in “Iruttukadai “. Of course, its very difficult to reproduce the same at home because Nellai people used to say, the taste of halwa is due to the use of thamirabarani river water and the original recipe is kept secret :). But I followed the video and tried to bring its taste close to the original halwa. I am happy with this recipe. Though its a time consuming process , its worth the effort..Please go through the Notes section for some tips..
Water – 6 cups + extra for grinding the soaked whole wheat. Soak the whole wheat berries over nite or for 8 hrs. Drain the water and grind to make a smooth paste by adding water. It took half an hour to grind completely. ( i used grinder) No matter how much water u add here for grinding. Remove and take the extract by filtering it twice or thrice.U’ll get a white milk . Take the milk in a wide bowl , close and allow it to ferment for 10hrs. 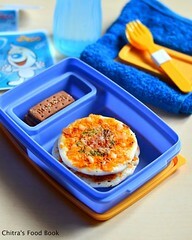 The next day u’ll c a layer of water getting separated. Without disturbing the sediment , just drain the water in the top. U’ll get a thick milk around 1.5 cups. Now add 6 cups of water as i mentioned in the ingredients and mix well. Add the sugar and take the mixture in a deep , wide bowl. Stir the sugar till it dissolves in the wheat milk mixed with water and allow it to boil. It takes nearly 50 mins – 1hr to get cooked. keep in a medium flame and make sure it don't get burnt.Stir for every 3 mins. U can cover & cook . At one stage u’ll find the halwa starts to leave the sides , turns glossy and non sticky. Now add the roasted cashews.By the time the halwa gets cooked , the color will be changed automatically. If needed, add few drops of food color too. Add ghee little by little say 2 tbsp . As soon as u add the ghee, u’ll find it easy to stir but after some minutes halwa absorbs all the ghee and solidifies making it difficult to stir. Again add little ghee.Continue the same process . At one stage , the halwa starts to ooze out the ghee it took. At this time stop adding ghee and remove the ghee ( it oozes out ) in a separate bowl. Mix well and collect all the ghee.The halwa starts to rotate holding the ladle. This is the final step.Switch off the stove and allow the halwa to be in the same bowl. This helps thickening of halwa . 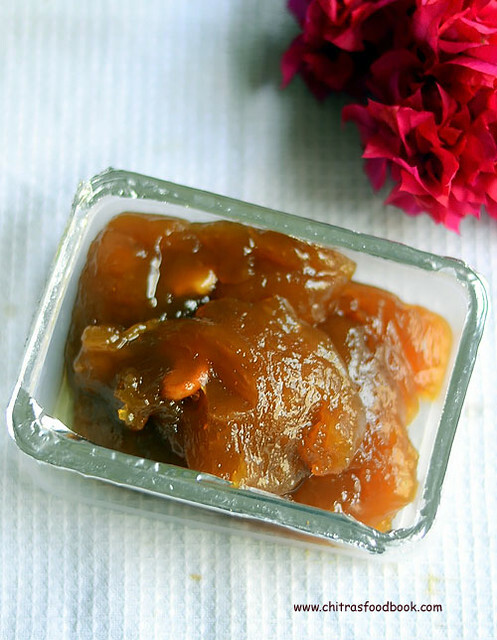 Delicious tirunelveli halwa is ready to enjoy !! 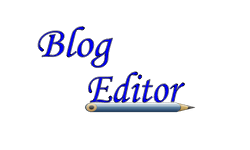 Here i’ve combined the method i saw in the video & blog. Actually the procedure is to make a sugar syrup of one thread consistency before adding the wheat milk.This helps to quicken the process of cooking.But i followed what’s mentioned in that video. In that video , he has mentioned to add the ghee and remove immediately. But the thing is u’ve to add all the ghee little by little and stir till the ghee comes out back.This is the correct procedure i feel.Its missed in the video.Also the sugar quantity he said is more.Please add the amount i’ve given here.Sweet lovers , add little more. U can use the collected ghee for making other sweets or in ur daily cooking.No need to waste it. The point is the halwa should slide down when u take in a spoon . please take care not to over cook it. For this measurement , u’ll get nearly 3/4 kg of halwa. Total preparation time for this halwa would be around 1 hr 15 mins. My neighbor gave me a homemade health mix powder and told me to make dosa with it. It tasted excellent. My hubby loved it.Its color & taste is similar to ragi dosa.I prepared tomato chutney as accompaniment.I asked her the ingredients of the powder,ground in mill and kept it.I make this once in a week nowadays instead of the usual ragi dosa .Try this , iam sure u’ll love this healthy dosa. Take one cup of health mix powder in a wide mouthed bowl and add the sour curd , salt , pepper corns with required water . Mix well to make a dosa batter consistency.I made it watery to get a crispy dosa. Heat a dosa tawa and pour the batter in a circular manner from outwards. Drizzle little oil and cook on both sides. Enjoy eating this crispy , lacy , hot dosa with tomato or coconut chutney !! If u want to prepare the dosa instantly , u need to add the curd for sour taste.If u prepare the batter before 3-4 hrs , no need to use the curd.It will be fermented by the time u make dosa.So please use the ingredients accordingly. 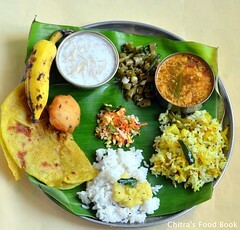 Set dosa and sagu recipe is a famous breakfast combo in Karnataka. I tried this recipe from Mrs. Mallika Badrinath’s cookbook and got credits from my family. I made some small changes in the actual recipe. I omitted food color this time and used chana dal. So the color of the dosa you see in picture is its original color. It was very soft and spongy too like a pancake. MB suggested carrot kurma as side dish. So I prepared the same. Yes, its really a good combo. It was mildly sweet like we get in Karnataka restaurants. If you like this combo, try this kurma. Else you can make mixed vegetable kurma. It also tastes good. 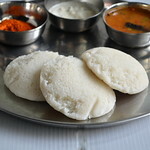 I prepared coconut chutney too. We had a nice breakfast today ! 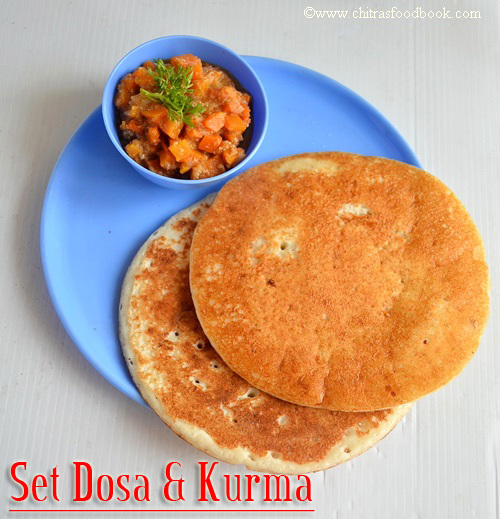 Lets see how to make set dosa with a side dish. Wash and soak the rice, dal,methi seeds together for 2 hrs. Grind to a smooth paste adding curd . Add salt at the end before removing the batter. Allow it to ferment for minimum 15hrs. Next day add the cooking soda (optional) , a pinch of sugar. Mix well. Heat the pan and make small dosa.Do not spread it well.Pour little oil around it.Cover cook or in open pan for sometime.Flip if necessary or serve as it is. In some hotels,this dosa is cooked on one side.So its ur choice.. Serve two dosas as a set. Wash and chop carrot and set aside. Heat oil in a kadai and add the cinnamon,cloves. Then add onions,tomatoes and carrot pieces.Saute till tomato turns mushy. Now add the turmeric powder , salt , red chilly powder and ground paste with the required water. Saute well.Pressure cook for one or two whistles.Remove,check for water content and boil for more time to thicken more. For variations,u can add peas and beans too.Do not add more carrots as the gravy tastes sweet.So use less carrot and more spices.